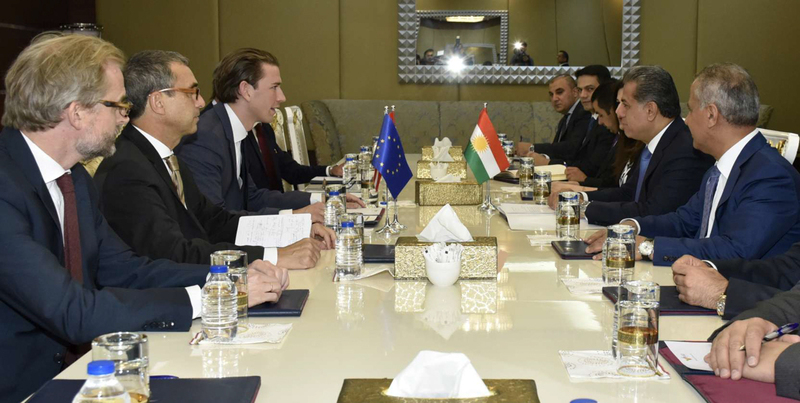 On Friday, 15 July 2016, Austrian Foreign Minister Sebastian Kurz and his delegation visited the Kurdistan Region for two days. On the spot the Minister met with various representatives of the Kurdistan Regional Government, including Prime Minister Nechirvan Barzani, as well as with the head of the Department for Foreign Relations Minister Falah Mustafa Bakir. Moreover, Kurz met with representatives of international organizations and visited the Debaga camp for refugees and IDPs in order to visualize the current situation on the ground. Foreign Minister Kurz’s visit centered on the precarious humanitarian situation in the Region, while the Austrian Council of Ministers decided a 1.5 Million Euro humanitarian aid package last Tuesday in order to support internally displaced persons (IDPs) and mine victims. The Austrian Foreign Minister emphasized that his visit to Iraq was “a sign of solidarity with Iraq, and with the Kurdish people in particular”, who “confront Daesh at the frontlines”. KRG Prime Minister Nechirvan Barzani as well as Head of the Department of Foreign Relations Minister Falah Mustafa Bakir expressed their thankfulness for Austria’s generous support, while they emphasized the importance of having international partners in times of facing a humanitarian, military and economic crisis. Both sides commended the good bilateral relations between Austria and the Kurdistan Region and agreed on strengthening ties even more in the future. When the so-called Islamic State started to attack Iraq in August 2014, the number of refugees and IDPs increased exponentially. The Kurdistan Region currently provides shelter and security for more than 1.8 million refugees and IDPs and belongs to the most affected regions in the Middle East. As a consequence of the anticipated liberation of Mosul, the Kurdistan Regional Government expects another 250,000 to 750,000 IDPs. Hence, Minister Mustafa Bakir emphasized not only the importance of having a profound military plan for the liberation, but also a humanitarian plan as well as a strategy for the administration of Mosul after the liberation from Daesh. Representatives of the Region further highlight the resulting economic burden, which has, amongst other things, driven the Region into a financial crisis. In this context, Foreign Minister Kurz and his delegation met with representatives of the United Nations Development Programme (UNDP). In addition to the 1.5 Million Euro aid package for IDPs and their return to liberated areas, the Austrian Development Agency (ADA) wants to provide another half a Million Euros for the UNDP’s stability fund. A visit to the Debaga camp, which provides shelter for more than 20,000 IDPs, illustrated the humanitarian situation of the region and its challenges once again, while the latter were being discussed with representatives of the International Organization of Migration (IOM).